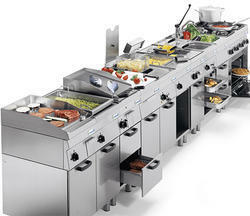 Manufacturer of a wide range of products which include restaurant kitchen equipment. We came up with the idea to serve people, and not just to sell products as one of the Restaurant kitchen equipment company in India. We keep in regular touch with our clients not only to apprise the progress of production but also to set realistic goals for closing the service calls with issues to minimize stressed. Choose from a range of on going Restauarant Kitchen Equipment services that take care of maintenance, repairs and deep-cleaning. If things go wrong, our specialist engineers will get you back on your feet, fast. After all, we always strive to be the solution to all your Restaurant kitchen equipment needs. Akreeti Industries has been a leaders in the manufacturing of Restaurant Kitchen Equipment sector for over 3 years. Our Products range is now universally recognized as a brand that stands for quality, restaurant kitchen safety, restaurant kitchen durability, performance and professional expert. Our Kitchen equipment is design to help you deals with the dual issues by providing product that are easy to operate, required minimum training and increase productivity in the Restaurant's Kitchen Equipment. Akreeti offered a full line of commercial kitchen equipment for restaurant that includes everything from freestanding range to custom island suites. The appreciated compact designed allows chefs to assembled the perfect lineup of Restaurant kitchen equipment or create a full suite to complement any personal cooking style according to chef. Packaging Details: Wooden box packing.